We love adding plants to our indoor spaces. They add character, purify the air, and bring so much positivity. Every room in our apartment is full of small cactus and succulents to hanging plants and indoor trees. Indoor hanging planters are so on-trend! They're an interesting way to display houseplants in any room. Super sturdy and perfect fit for many size bromeliads. To the eye is visually stunning for those who are into that artsy elegant look. This plant hanger will provide a classic and timeless look to your home and garden and will embellishes your living space. Blends seamlessly into its surroundings and goes great with most wall or ceiling colors, modern and classical styles. Beautify your indoor and outdoor living space by hanging this planter which comes equipped with hooks. Application: The balcony gardens, greening projects, household decoration, office, family gardening, malls, garden nursery production. Visit our storefront to see more sorts of cool air plant containers, flower planters, terrariums, pots and vases. [DURABLE WOODEN SHELF & WIRE METERIAL]：Made of natural fir wood board and firm knitted wire, this premium quality plant holder does not contain any artificial ingredients or chemicals and is made to last for several years. With two hooks at the top, is easy to hang anywhere, wall, windows or ceiling... This square frame allows air and light to pass through. [UNIQUE DECORATIONS FOR STYLISH HOME DÉCOR]：With attractive modern design, you can use this delicate air plant accessory to create a beautiful wall art display. Our airplants holder is 8.2"x8.2" large which is suitable to hold small to medium size air tillandsias. Truly beautiful bohemian style with great accent matches with any modern or conventional style. [EASY CARE & POWERFUL AIR PURIFIERS]：Air plants are very low maintenance. No need for soil and they only need water once a week. They will thrive virtually anywhere. Tillandsias have the power to both filter and cleanse the air. Improve the quality of your air with living air plants while beautifying your space at the same time. [IDEAL GIFT FOR PLANT LOVER]：Ideal at Festival time and Weddings to decorate pathways. It will be a great and practical gift for plant lover! A wonderful way to display your tillandsias air plants! Perfect for office gifts, birthday presents, holiday gift baskets, college student gifts or simply treat yourself, we know you'll love them! 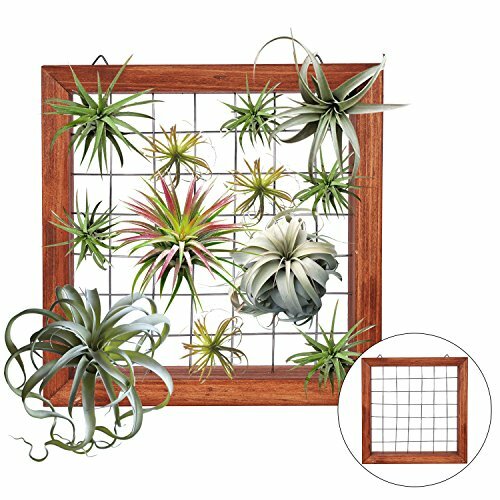 [AMAZING ASSORTMENT AIRPLANT HANGER]：Bromeliads house plants are exotic, fast growing, flowering plants that can be kept indoors or outside and are the perfect addition to your home, garden or office space. From terrariums to hanging mobile art, air plants can be used to create truly unique art, crafts, and gifts for all occasions. If you have any questions about this product by TC-Collection, contact us by completing and submitting the form below. If you are looking for a specif part number, please include it with your message.